A national daily has hailed the relaunch of three historic print titles in the South West as a sign that the “tide is starting to turn” for local newspapers. 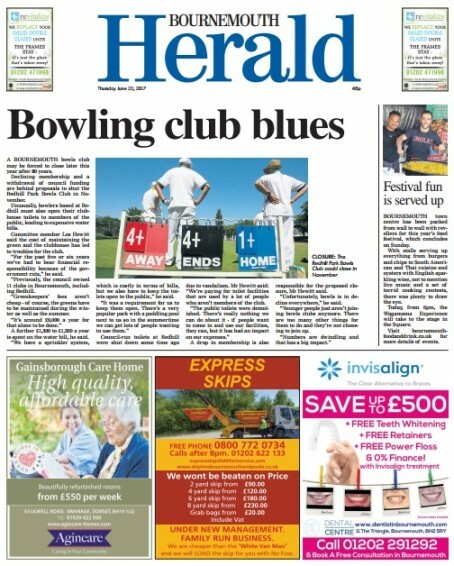 Regional publisher Newsquest recently revived the Bournemouth Herald and Poole Herald, which were last published in the 1980s, to replace the Bournemouth Advertiser and Poole Advertiser. The move follows the launch of another weekly heritage title, the Christchurch Times, in March. The relaunches were applauded in a leading article in The Times focusing on the importance of local press scrutiny in the Grenfell Tower disaster. It wrote: “The regional media has dwindled in recent decades and too many local politicians have developed a taste for secrecy. “Early signs of a local press revival are welcome, therefore, and councils should relish the opportunity to communicate with constituents. “There are signs that the tide is starting to turn. Three Dorset newspapers have returned to print decades after the last copy was sold. The Christchurch Times, Bournemouth Herald and Poole Herald all go back into circulation this year. “These are promising developments, worthy of support. It is welcome, for instance, that a change in the law in force from today will mean that anyone can inspect councils’ financial records in person, regardless of whether they live in the borough. Commenting on the article, Newsquest chief executive Henry Faure Walker said: “The role of trusted local journalism in communities is more important now than ever before. At times of heightened uncertainty, people turn to brands they can trust – local news brands in digital and print – to find out what’s going on. Ah the revival of papers. someone was bound to claim it sooner or later, as digital thrashes around in the water looking for a lifeboat. Plenty of lifeboats in Poole, Paperboy!